or a battery. With so many types of batteries on the market and almost none labelled for sump pumps, which do you choose? You could, of course skip the hassle and purchase a back-up sump pump that comes with the battery, but in case you haven't or need a replacement - read on. When you're shopping for a battery, you'll notice terms being thrown around like: "deep-cycle", "maintenance-free", "marine", and "solar". Since they're used interchangeably to describe lead-acid batteries, buying the right one can be confusing. So, let's decode the battery nomenclature that will help you differentiate one battery from the next. The most inexpensive type of battery, wet-cell or "flooded" types are most commonly found in automotive applications. They do a great job in short bursts to start your car, but you wouldn't want them to power your sump pump for an extended period; that's why they're called "starting batteries". The only exception is a deep-cycle version. Made up of acid-covered lead plates submerged in electrolyte, wet-cell batteries come in both sealed and unsealed versions. Regardless of the version, both require periodic inspection to keep the lead cells from drying out to prevent damage. Maintaining these batteries is a dangerous task as you'll be exposed to lead, acid, noxious gas, and the risk of explosion. AGM stands for Absorbed Glass Mat and is a technologically superior battery perfect for back-up sump pump systems. 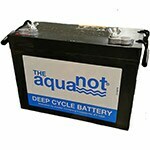 AGM batteries feature a unique design that encapsulates the lead-acid cells in glass fiber material that absorbs electrolytes (only enough to keep it wet rather than being completely submerged) and won't leak if punctured, making them relatively safe. The design also allows for the cells to be stacked closer together allowing for increased energy capacity and faster charging times. AGM batteries are considered truly "maintenance free", meaning you don't have to worry about the cells drying out and trying to add water yourself. They do tend to be more expensive, but the many safety and performance features far outweigh the cost. A gel battery is similar to a wet-cell battery, except is filled with a gelled electrolyte using silica gel. You know those packets that come in your vitamin bottles? They contain the same type of material used in gel batteries. Also considered "maintenance free", the gel will not evaporate, making gel batteries ideal in tougher situations where there is extreme temperatures and vibrations; which is why there most often found in racing and off-road vehicles as well as wind and solar applications. However, since the gel design prevents rapid movement, ion exchange and peak current capacity is also reduced along with fast-charging capability. The deep cycle designation itself does not indicate the type of battery, but rather the battery's charging cycle and is an important term to know when looking for a sump pump battery. If you know nothing else about batteries, you'll be miles in front of the pack. These batteries are made for constant charging and discharging, ("cycling") without rapidly degrading the integrity of the battery. Although they cannot deliver the higher current of a wet-cell battery, they feature thicker plates and are able to be discharged to a much greater degree. A compromise between these characteristics (higher starting/lower discharging capacity) are often called "Marine/RV" batteries. 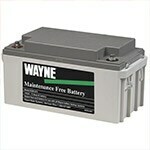 Maintenance Free - As you've read, the term "maintenance-free" can be misleading depending on the battery type. For wet-cell types, maintenance-free means these batteries are sealed and are sometimes valve regulated (VRLA) in which the hydrogen and oxygen produced by the cells are reconstituted back into the water, thereby reducing leakage and rapid evaporation. Even though they're called "maintenance-free", it really is a misnomer because they still require maintenance to prevent the cells from drying out and losing their capacity to cycle. So, how to do you check a sealed maintenance-free battery? The easiest way, is to see if the battery has a sight glass that will indicate low electrolyte levels. The other way, is to check the battery's performance using a multi-meter. Pro Tip: Regardless of type, you should never place or store a battery directly on the ground, doing so will drain the battery and shorten its life. Instead, you could use a battery case and make a habit to check and clean your battery terminals per the manufacturers recommendation every 3 months. Now that you know how to pick the perfect battery for your sump pump and know when and how to get a replacement, you won't have to worry about it failing when you need it most. If you have questions about specific sump pumps and batteries, the experts here at Sump Pumps Direct are ready to answer. Sump Pump Battery Buyer's Guide.. Our Power Equipment Direct how-to library can help you learn about Proposition 65 Product Labeling, Introducing Barnes Sump Pumps and Sales Tax Information.